Social Media Day Panama 2017, organized by DELL, the Innovation Center of the City of Knowledge Foundation, and Social Snack, will take place on Friday, June 30th at the City of Knowledge Convention Center. Social Media Day is a worldwide event, taking place not only in Panama but in hundreds of cities around the world. Social Media Day was started by Mashable.com, a popular source for tech, digital culture and entertainment content, to herald the contributions made by social networks. Social Media Day Panama (#SMDayPA) was held for the first time in 2010 in the City of Knowledge, and has taken place there ever since. 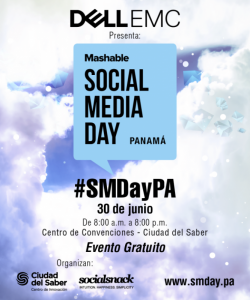 Social Media Day is the first and largest event that focuses solely on social networks in Panama. It is a space where different digital and marketing communities and professionals can meet, as well as the general public interested in social networks and the Internet. Registration for the #SMDayPA is open!